EO Face Moisturizer Review (2018): Is It Worth Buying? 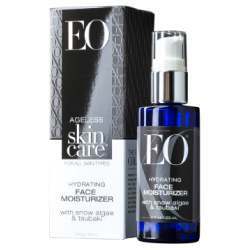 EO Ageless Skin Care Hydrating Face Moisturizer, US $34.99 for a 2 fl. oz. bottle, is a moisturizer that also functions as an anti-pollution product that helps protect and immediately relieve your skin from the damaging effects of day-to-day urban pollution. About EO Face Moisturizer — Does It Really Work? This product is brought to you by EO, the skin care company that creates products founded on the power of essential oils (EO) to heal and restore your skin’s youthful health and vitality. According to the manufacturer, essential oils are “the heart and soul of everything we create”. Improve the smoothness and silkiness of your skin’s outer surface. Boost your antioxidant levels to give your skin better protection from factors that damage and age your skin. Decrease the depth and length of skin creases which, in turn, smoothens and fades the appearance of wrinkles and fine lines. Replenish your skin’s lost moisture and nutrient content to support a more efficient delivery system for repairing and regenerating your skin. Deliver a relaxing and soothing relief to your senses that also calms down skin irritations. What Are The Ingredients In EO Face Moisturizer? Snow Algae Extract: Relaxes your skin, it also has anti-inflammatory properties that evens out your skin tone and promotes better hydration. Tsubaki Oil: It has anti-aging properties that smoothens out wrinkles and fine lines, making these appear visibly faded, shallower, and less prominent. Plant-Based Antioxidants: Protect your skin and revives its healthy radiance at the same time. Botanical Oils: These significantly condition your skin and have anti-aging properties that support better skin hydration and more efficient healing. Essential Oils: Top-billed by rose, frankincense and lemon, these deliver a significant moisture boost that also relieves your skin from chronic dryness and irritation. EO Face Moisturizer is recommended for daily use. EO Face Moisturizer has a smooth, velvety texture that luxuriously glides on your skin and leaves it with a silky feel that lasts the whole day. This product contains plant-based extracts that significantly amps your skin health and protection. This product has a thick consistency that can end up giving you greasy skin in the middle of the day, and make your makeup slip as a result. The formula has a strong scent that can be major turnoff, most especially when you have a sensitive sense of smell. EO Face Moisturizer reviews indicate that this product can significantly boost your skin’s moisture content but not deliver any visible improvements in the appearance of wrinkles and fine lines. Does EO Face Moisturizer Have Any Side Effects? Based on the ingredients and reviews, the only side effects that may be experienced when using EO Ageless Skin Care Hydrating Face Moisturizer are skin irritations and allergic reactions due to a long list of botanical ingredients, depending on your history of allergies. EO Face Moisturizer can indeed be seriously hydrating. That, however, makes it a poor choice if you love putting on makeup. There’s also very limited detail about how this product is intended to deliver anti-aging benefits. It is likely moisturizing but probably won’t result to visible improvements in the appearance of wrinkles and fine lines.